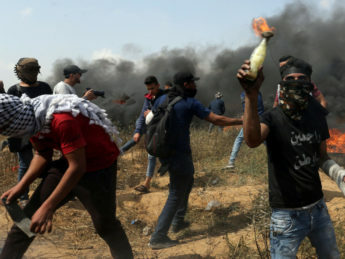 Eighty percent of Palestinian casualties during the "Great Return March" at the Israel-Gaza border have been linked to terrorist groups, according to a new report. The Palestinian Authority continues to violate the Oslo accords which created it. And the media continues to ignore the violations. A new generation of Palestinian leaders are rising to the fore. Committed to terrorism, the media seems equally committed to ignoring their ascendance, as CAMERA notes in The Washington Jewish Week. CAMERA takes a look at the Tanzim faction, an underreported group that is likely to dominate the future of the Palestinian Authority. The New York Times indicts the morality of Israeli society on page one, above the fold. Isabel Kershner writes that "the poisoned political environment around the Israeli-Palestinian conflict has affected the moral compass of youths growing up within it." Lourdes Garcia-Navarro’s interview with Palestinian Prime Minister Salam Fayyad typifies all that is wrong with NPR coverage on Israel: it is shallow, one-sided, and focuses on narratives in which only Israel can be blamed. The Baltimore Sun headlined a February 13 editorial "Mr. Abbas' mission; Unity between Hamas and the Palestinian Authority need not be the end of peace talks with Israel -- but it will require real statesmanship." CAMERA's next-day letter introduced Sun readers to the contradictory reality. The AP issues a clarification after reporting that Fahmi Shabaneh, the Palestinian whistleblower who exposed widespread corruption on the part of top Palestinian Authority officials, had been fired two years ago. One week after British Member of Parliament George Galloway was able to portray himself as a man of peace in a local Boston newspaper, CAMERA revealed the man's role as an apologist for murderers and dictators in the Middle East.